Adonidia merrillii (Christmas/Manila Palm), small yet impressive! Currently, we only maintain two young Christmas Palms which were propagated from dried seeds gathered from beneath a palm tree by the roadside, around late 2005 if I recall correctly. Undeterred, we still grow one in a pot, while the other is on the sidewalk outside our home. 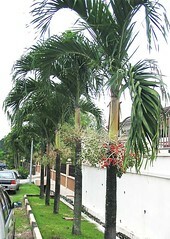 Comparatively and as expected, the grounded palm tree is very much healthier, luscious and taller! 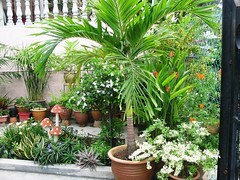 Common Name: Manila Palm, Christmas Palm, Dwarf Royal Palm. Plant type: An ornamental and evergreen palm tree, native to the Philippines where it is popularly grown in its capital city, hence commonly known as Manila Palm. Light: Prefers full sun though can tolerate semi-shade. Moisture: Moderate water regularly. Quite drought and salt tolerant. Soil: Grow in a wide variety of well-drained soil – can be clayey, loamy, sandy, slightly alkaline or acidic. Propagation: Easily by seeds. Collect some seeds (look like dried-up fruits, hard and covered with straw-like husk) laying on the ground, bring home, scatter and push them about 0.5 inch deep into your garden bed or potted soil at a sunny spot. With regular watering, they should germinate within 1-3 months. 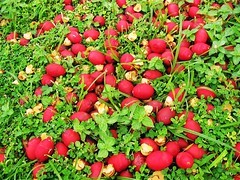 Germination can be hastened by soaking the seeds for 3 days or by scarifying before planting. 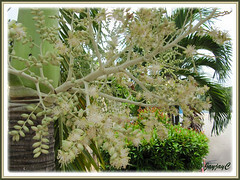 Features: Adonidia merrillii is a small to medium-sized, single-trunked palm tree growing moderately fast to a height about 20 ft, though often much shorter and with a frond spread about 6-10 ft. Upright and slender, its greyish stem is ringed by semi-circular leaf scars and topped by a 2-3 ft smooth and light green crown shaft that supports a crown of about a dozen pinnate (feathery) fronds. The attractive arching fronds are about 5 ft long with deep-green strap-shaped leaflets that are about 2 ft long and 2 inches wide. 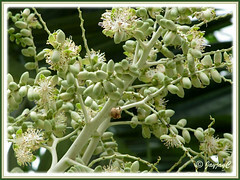 At the base of the crown shaft adjoining the trunk will emerge 2 feet long inflorescences, bearing inconspicuous butter-cream colored flowers that gradually become 1-inch long ovoid light-green fruits (in autumn). Update: March 9 2013 – Observed that whenever a withered frond is removed, a budding flower stalk is revealed beneath. 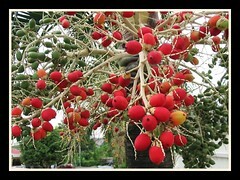 These clusters of fruits will ripen and beautifully transform to a glossy and brilliant red color (in winter), resembling Christmas ornaments, hence the palm’s common name, Christmas Palm. In the tropics, these showy fruits are seen frequently throughout the year, basking in our tropical sun! 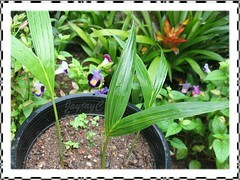 Care: This stately palm tree, Adonidia merrillii is so easy to grow and practically thrive on neglect. Probably our abundant rain, sun and humidity in the tropics is conducive for its growth as we’ve seen them flourishing unattended along highways and roadsides. However, if home-grown, just remember that it loves the sun as with most tropical palms, and to water well and feed once monthly. Remove dried fronds that are within reach, to keep it tidy. Hardly bothered by diseases and pests. Unfortunately, this palm is very susceptible to lethal yellowing disease in certain regions, like Florida and Texas. 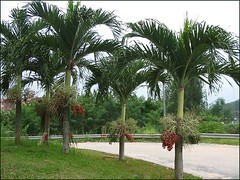 Usage: Spectacular, when grown as a landscape palm along streets or sidewalks, highways, roadsides, roundabouts and road dividers. Also, Adonidia merillii is impressive whether grown singly or in a group of two, three or more in residential and commercial areas, parks, gardens and even close to swimming pools. Well-suited too in containers as an accent or specimen tree at courtyard, porch, deck or patio, though do ensure its container or above-ground planter is of good quality to prevent breakage. Being small, neat and elegant, Christmas Palm is now popularly used as an indoor decor plant in homes, offices and shopping malls. For sub-tropical & temperate regions: Cold hardiness: USDA Zone 10b through 11. Suitable only in frost-free regions. Check Florida Gardener’s site and the University of Florida’s site which contains plant fact sheets on a variety of palms, including Veitchia merrillii. Do you need to peal the red skin off the Adonidia merrillii seeds before you soak them to plant? We haven’t tried that way, Deborah. Just to experiment, you can try peeling the skin off the fresh red fruits and see if that would hasten the germination process. Or simply, just sun the fruits until they’re dried and scarify them before sowing in soil. All the best to you! Please share your experience here when you succeed so that we can learn from one another. Thanks. 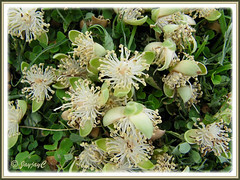 Any particular type of soil (s) for Veitchia Merrilli in the South Fl Area – Sandy, black Soil, Rocky, etc…? Best Fertilizer, Watering, Insect Attacks…? Thank you, your Site is most instructive and appreciated.. Thanks for your kind comments and appreciation, Hugo. For more info, you can probably try the University of Florida’s site link which we have provided above. I’ve just updated its broken link… it appears they have now provided the fact sheets in PDF format, no longer in HTML. I have a problem with 3 of my 4 Christmas palms. It has a fungus type film on the leafs. I spayed with Diazinon and saw several whiteflyies. Is his my problem or is this a fungus? Hi Ada Ryan! Are you sure that your palm is the Christmas Palm (Adonidia merrillii) as photographed in our article above? 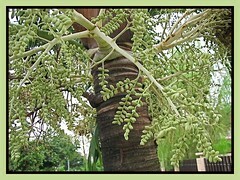 This plant is a single-trunked palm tree that does not produce suckers (offsets). I was wondering if the fruits are edible or even poisonous. Is it safe to extract oil from the kernels to make soap and candles? Sorry Suzanne… we’re clueless on the matters raised. i noticed on my 6 yr old manila palms that the bulbous trunk at the base is not touching the soil (even though i have replenished it before) and I can see the inner smaller trunk inside. Is this a problem and can it break under windy conditions of 10-20 mph? I have tried the mycorrhizal fungi for the root system. Otherwise, the leaves are ok and growing nicely. aloha! i am still waiting for comments regarding the above question. the outer bulbous trunk is about 1 inch above the soil surface. i am very curious and anticipating your remarks. Sorry, Zacarias… as we were unable to assist you on the matter raised, we left it open to visitors that may be able to help you. Anyway, I’d advise you to pose your question to Palm-talk forums such as the official forum of the International Palm Society Inc. (IPS) for experts to help out. My neighbor has given me permission to use the seeds off of his palm. I’m super excited by all of your advise. Many sources think the fruit is not edible, if I find out anything more about this I will let you know. Thanks, Packie. We’d appreciate for any update on its fruits’ edibility. Our elder boy who has a 7-year old palm tree informed us that squirrels just love gorging the fruits… no wonder our ripened red fruits are scarce now! Manila palm as Candy .. Yum! Yum! Yum! Sorry, we have no idea whether the fruits are edible, Robert. Please google search for answers. I have three Christmas palms producing berries. I went to a swamp meet in Hawaii where I live. A man was selling each bunch for $5.00. I asked him if he was selling to use for new seedling plantings. He peeled off the skin and began eating one saying they were good for the stomach. When I got home I tried one. Not a good taste. We have many of these palms (in Mexico) and my chickens LOVE eating the fruit. I have not tried it myself. Hi John Forget… we’ve never tried eating them too. Thanks for sharing about your chickens enjoying them, at least the fruits aren’t wasted. 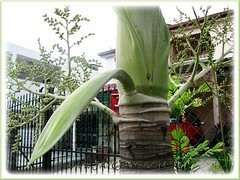 is there any products made from leaf sheaths of this palm tree? 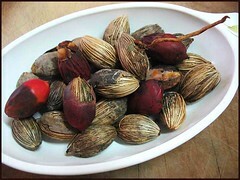 I have made an excellent drink from the palm seed and in the process of bottling it and put it on the market. All the very best in your endeavour and business acumen, George Richards. 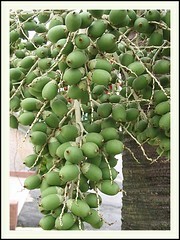 IS the fruit of Manila palm edible ? How does it taste ? Sorry Yudi… we have no clue whether the fruits are edible.